It’s odd to think that the secret to finding meaning in our lives might have come from a senseless situation. 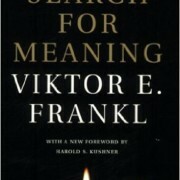 In the midst of the holocaust a man by the name of Viktor Frankl found the secret to surviving impossible circumstances and in the process developed a perspective on the meaning of life. 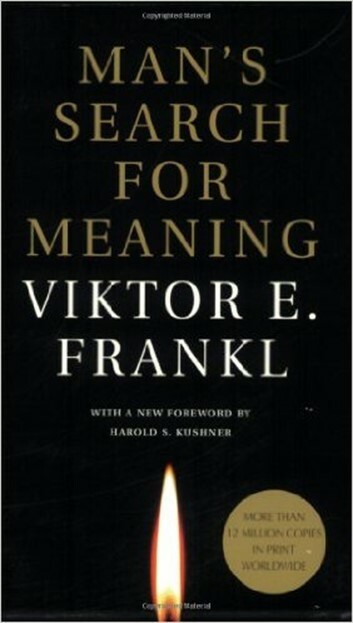 In Man’s Search for Meaning we get a glimpse of the experiences Frankl had as a prisoner in several concentration camps but more importantly we get a glimpse of the Logotherapy that he developed after he survived the ordeal. There’s a game that sometimes gets played by adults and teenagers. The rules are simple. Your goal is to out suffer the other players. You complain about your day. They complain about theirs. Eventually someone pulls the crazy mom card and the game is over. We’ve got a strange preoccupation with sharing how we’ve been mistreated in our lives. We’ve got a strange desire to get others to feel like we’ve suffered more than they have. The truth is that our suffering is all relative. It’s not about our relatives or from our relatives but it is all relative. A hard day for you might be that you were in an automobile accident. A hard day for someone else might be that they lost their spouse. It’s all relative. At the same time this game teaches that we’re not alone in the world. We’ve all seen suffering. We’ve all been harmed, limited, and held down. The game of suffering helps us know that we’re not alone. More than that the game frequently ends with us learning that at least in some respects there is someone else who has it worse than we do. Somehow these two things. First, that we’re not alone. Second, that there are others that have it worse help us accept our condition and seek to move past it. The Rise of Superman has a series of amazing stories about action-adventure sports athletes that continued to perform even after they were seriously hurt. Pain that most of us would find crippling was managed. Those who had a clear purpose and objective managed to continue where most of us would stop. Nietzsche said “He who has a Why to live for can bear almost any How.” That is when we have a reason for our lives, when we can rationalize our pain for a purpose, we’ll be able to survive unspeakable conditions. It seems that Hope has a twin sister and that sister is Meaning. Hope can sustain us for a while in difficult situations but its Hope’s sister that lifts us outside of the situation that disconnects the reality of the pain we’re going through and creates for us a path that allows us to walk outside of the pain. There isn’t a universal meaning that all of us are born with. Certainly we have ingrained things like our need to be connected to other human beings. However, the meaning that I find in my life and the meaning that you find in your life aren’t likely to be the same. I might be focused on making the human condition just a bit more understandable. You might be more focused on reducing the harm that befalls children. Both are noble purposes and sufficient meaning but they’re – obviously – not the same. If you have a meaning, a purpose, a true goal in your life, then the challenges that you face aren’t so overwhelming. For me if I ever write my biography (which I’m certain no one would trouble themselves to read) I’ll probably call it “A Few Hard Weeks.” My life seems to be a series of challenges that are a few weeks or months where I’ll pour myself into something. I don’t mind the hard work because of the results that come at the end. Having author credit on 25 books comes one at a time. Rarely do people hear that I’ve written several books and they don’t wonder about my sanity for having done it the second time. Sure it’s hard work – but it’s worth it. Have you ever noticed that after one member of an old couple dies that the spouse often joins them in death within a year? Certainly this can be attributed to the depression that naturally occurs after the loss of a spouse. However, in many cases it seems like the remaining spouse has lost their meaning and purpose. If you’re not carrying on to be a part of the union with the missing spouse then what are you doing? What about the lottery winners who have worked hard all their lives to just make ends meet and suddenly their basic needs are more than covered? Why do so many of them end up depressed and bankrupt only a few years later? The daily grind as uninspiring as it may seem provides some context for meaning in most of our lives. We’re providing for our family. We’re providing them “the good life.” We’re preparing them to have a better life than we have. We want for them a college experience and the opportunity to do more than we have done. What, however, do we do, when the challenge isn’t there any longer? How Children Succeed says that “that what kids need more than anything is a little hardship: some challenge, some deprivation that they can overcome, even if just to prove to themselves that they can.” From cradle to grave we need challenge. We need meaning. We need to do something that matters. When that disappears we’re lost until we find that next meaning to our lives. We hear stories of “empty nesters” who have lost their children to college who are suddenly thrust into a new world and often don’t know what to do with it. For my wife and I we’re relishing the idea that the kids won’t live in the house. However, our meaning is defined multi-generationally. That is to say that we’re looking forward to supporting our children and their grandchildren. We don’t view our mission as getting the children to college. We view our family mission as supporting the children and grandchildren. In my criticism of the book The ONE Thing I mentioned that there isn’t one thing. There’s one thing in each area of your life. However, as it relates to keeping from entering a tail spin when you accomplish one of your missions, this is a good thing. For family your mission might be getting your kids ready for college. In your professional career it might be getting the next promotion. Your community/social goal might be restoring a club of civic organization to its former glory. While this argues against the central point of The ONE Thing, it does support a balanced life and it does help you when you accomplish your mission. (Emotional Awareness speaks about the sukha state of flourishing that comes from balance.) Accomplishing one of your missions only leaves you directionless in one area of your life – not in your life in general. In my review of Chasing the Scream I shared how addictions are really the bubbling up of pain. It’s how people are trying to suppress the pains of the past as they leak into the present. Frankl says that some of the long prisoners “needed schnapps.” He was speaking about how they needed something to help numb the pain of the camp and their current life situation. I used to give out Chinese finger traps in some of my presentations. For the presentation it was an illustration for how knowing how to solve a problem made the problem easy. The Chinese finger trap is a simple device. You place your index fingers in and try to pull them out. The harder you pull the harder it gets to get out of the trap – until you break the trap or you break the cycle. By pushing into the trap a bit more and leveraging your thumb to push up the trap once the pressure is released your fingers can be freed. Logotherapy also focuses on our lives as a way to accomplish our meaning – and not for our self-gratification. In the words of The Time Paradox we’re not all hedonists. In Man’s Search for Meaning I didn’t find my meaning, but the picture seemed to get a little bit clearer. Can you find your meaning in Man’s Search for Meaning?